We’d love your help. Let us know what’s wrong with this preview of Essential One Dish favourites by Test Kitchen Canadian Living. When life gets complicated, everyone looks for solutions to make meal prep simpler and less stressful. Our one-dish recipes make it easy: just one recipe to follow and one serving dish (less cleanup!) for a balanced meal with protein, starch and vegetables. The food specialists at work in the Canadian Living Test Kitchen have gathered more than 90 Tested-Till-Perfect recip When life gets complicated, everyone looks for solutions to make meal prep simpler and less stressful. Our one-dish recipes make it easy: just one recipe to follow and one serving dish (less cleanup!) for a balanced meal with protein, starch and vegetables. The food specialists at work in the Canadian Living Test Kitchen have gathered more than 90 Tested-Till-Perfect recipes, from comfort-food skillets, bakes and stews to filling salads and versatile nourish bowls. Whether you’re looking for a family-friendly lunch or a dinner recipe for entertaining, Canadian Living’s trusted recipes will always taste as good in your kitchen as they did in ours. 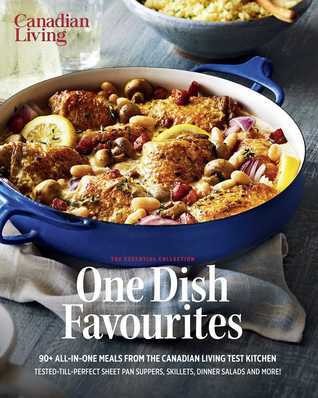 This cookbook, part of Canadian Living’s Essentials Collection, builds on the success of our popular The One-Dish Collection, with all-new recipes in a compact, budget-friendly edition. One-Dish Favourites also features mouthwatering colour photographs throughout, created by some of Canada’s top food photographers and food stylists. To ask other readers questions about Essential One Dish favourites, please sign up. I was really disappointed that this cookbook contains a number of slow cooker recipes--not everyone has a slow cooker, and there are plenty of slow cooker recipe books. Overall, this book didn't have as many "must try" recipes as I'd hoped, but at least everything is made from scratch, not "take this packet of chemicals and mix it with this box of other chemicals" like the last Casseroles cookbook I read. So the meals are reasonably healthy. Haven't tried anything yet, but "Sheet Pan Greek Chicken I was really disappointed that this cookbook contains a number of slow cooker recipes--not everyone has a slow cooker, and there are plenty of slow cooker recipe books. Haven't tried anything yet, but "Sheet Pan Greek Chicken and Lemon Potatoes," "Peanut Shrimp Crunch Bowls," "Beef and Pepper Black Bean Udon Noodles," and "Butter Chicken Mac & Cheese Skillet" are among the recipes that look promising. There's a recipe for Bouillabaisse that seems almost ridiculously complicated, but I still might give it a try. Excellent! Tons of great (and mostly easy) recipes. Plenty of variety. Enjoy.